Makati City—April 19, 2017— Offshore Music’s Apartel, treats customers of Buddha-Bar Manila to an evening of soul and funk music, as well as unparalleled entertainment with the bar’s “Big M Night.” The event also sets the stage for the grand draw of this year’s winner of “Dine and Drive a Maserati” promo this Saturday, April 29, 2017. Local Acts and DJs – Pasta Groove, Lustbass and Tarsius will also be performing and Evan Spargo will be hosting the event, adding to give customers a spectacular “mafia” themed night. “Buddha-Bar has been known for spectacular and unique parties that we arrange specially for our customers. This time, we are leveling it up with our Big M Night. We will treat them with Apartel’s good music, as well as with chances to win big prizes from our sponsors, including the Maserati Ghilbi,” said Bernadette Castillo, Sales & Marketing Head of Buddha Bar Manila. The grand draw of the “Dine and Drive a Maserati,” which runs from January 30, 2016 to April 29, 2017, (Per DTI-FTEB SPD Permit No. 0424, Series of 2016), is one of the event’s highlight. For a single receipt purchase of a la carte items worth as low as PhP 5,000 pesos, or PhP 30,000 on banquet events, customers can find themselves behind the steering wheel of a brand new luxurious Maserati Ghibli. Buddha-Bar will also give away gift certificates, merchandises and other surprise prizes from its sponsors, which include Skyjet Airlines, Maserati and Offshore Music. Customers will also get the chance to be one of the winners of round trip tickets to a perfect get away from Skyjet Airlines. 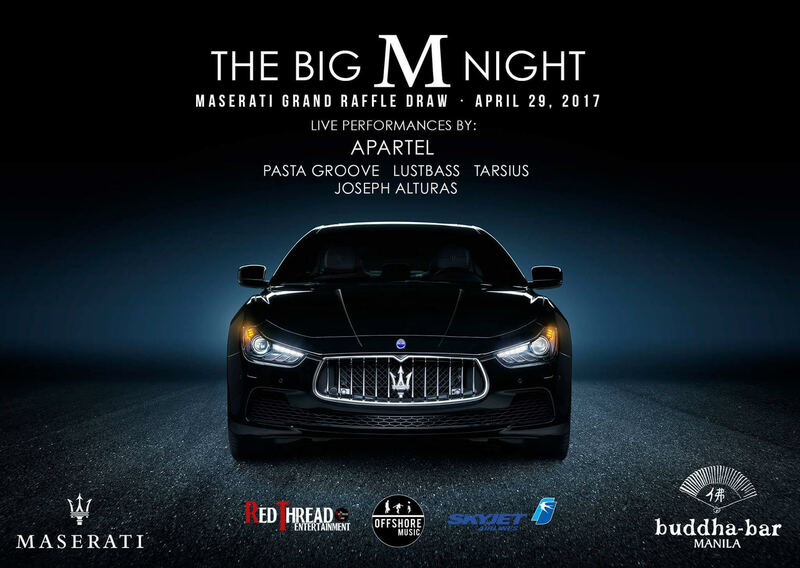 “We are inviting all the music, traveling, and Maserati enthusiasts out there to come and party with us at our Big M Night. This is one of our biggest party yet, where customers get the chance to both win huge prizes and to be entertained. We also invite all those who already joined the “Dine and Drive a Maserati” promo to personally claim their dream Maserati Ghibli,” Castillo added. Since it first opened in 2012, Buddha Bar-Manila has been dedicated to offering different themed events for its customers. It also carries the sophistication and the world-class service offered by the Buddha-Bar International franchise, based in Paris, France. It has also brought the luscious taste of Modern Asian and Western cuisine. Buddha-Bar Manila is located at Picar Place, Kalayaan Ave. Makati City. For inquiries and reservations, please call 8566719, 8566859, or 09989833918.